This time, scientists are excited to find nothing. In results announced today, a huge physics experiment builtto detect gravitational waves has yet to find any. Rather than be disappointed by the null findings, physicistssay the results were expected, and in fact help them narrow down possibilitiesfor what the universe was like just after it was born. The Laser Interferometer Gravitational-Wave ObservatoryScientific Collaboration (LIGO) is a set ofinstruments in Louisiana and Washington built to search for evidence of gravitationalwaves, which are theoretical ripples in space-time thought to be caused bythe acceleration of mass. No one has yet directly detected these waves, thoughthey are predicted by Einstein's theory of General Relativity, and are widelythought to permeate our universe. In theory, every time mass accelerates - even when you riseup out of your chair - the curvatureof space-time changes, and ripples are produced. However, the gravitationalwaves produced by one person are so small as to be negligible. The wavesproduced by large masses, though, such as the collision of twoblack holes or a large supernova explosion, could be large enough to bedetected. LIGO has only been running for a few years - the new resultsare based on measurements taken between 2005 to 2007 - and it is not yet at itshighest level of sensitivity. The fact that this first period of observationsdid not detect gravitational waves allows researchers to rule out thepossibility of waves above a certain amplitude threshold. Simply put, if therewere any waves big enough for LIGO to have detected them, it would have. Sinceit didn't, they aren't likely to exist. "I wouldn't say it's surprising that we're ruling themout," said Vuk Mandic, a physicist at the University of Minnesota who ledthe new analysis. Most physicists think the models that would have producedgravitational waves above the threshold that could have been seen so far areunlikely, he said. The next phase of the project, called AdvancedLIGO, will improve the experiment's sensitivity, allowing scientists toprobe a volume of space about 1,000 times larger than the current project'srange. "If Advanced LIGO doesn't see gravitational waves Ithink people will be very surprised," Mandic told SPACE.com. "It islikely such a situation would require revision of General Relativity." In particular, scientists are hoping to eventually findevidence for gravitational waves created by the Big Bang, the explosion thoughtto have begun the universe. According to theory, the Big Bang would have causeda flood of gravitational waves whose aftermath could still be seen today. Thisaftermath of many waves of different sizes and directions superimposed on topof each other, much like the chaotic surface of a pond after rain has fallen onit, is called the "stochastic background." LIGO's null result has limited the possible strength of thestochastic background. Now that researchers know this background can't bestrong enough to have been detected so far, they can put new constraints on thedetails of how the universe looked in its earliest moments. "The thing that makes this exciting is that this isreally the only way to probe the early universe," said David Reitze, aphysicist at the University of Florida and the spokesperson for the LIGOScientific Collaboration. "It's starting to limit some of the exoticmodels of cosmology." For example, some models predict the existence of cosmicstrings, which are loops in space-time that may have formed in the earlyuniverse and gotten stretched to large scales along with the expansion of theuniverse. These objects are thought to produce bursts of gravitational waves asthey oscillate. Since no large-amplitude gravitational waves were found, cosmicstrings, if they exist at all, must be smaller than some models predict. The results are detailed in the Aug. 20 issue of the journalNature. LIGO is composed of a series of L-shaped detectors. At eachdetector, a laser beam is split in half, with each half routed through one ofthe arms of the L, and then the two are reunited. If the two beams have travelledthe same distance in their separate arms, when they are merged again they willoverlap perfectly. 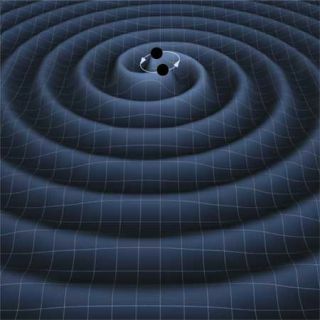 Gravitational waves are thought to stretch and compressdimensions of space-time perpendicular to the plane of the wave. If a strong enough gravitational wave passes through thearea of the detectors, it will stretch one of the arms of the L and shrink theother, causing the first laser beam to be offset from the second. Researcherswould notice this as a slight lessening of power in the resulting laser beam. If the same signal is found at the detectors in bothLouisiana and Washington, scientists can rule out a local fluke for theresults. "The experiments are challenging," Caltechphysicist Marc Kamionkowski, who was not involved in the LIGO project, wrote inan accompanying essay in Nature. "They require detection of minutechanges." Kamionkowski called LIGO "an experimental tour deforce." If LIGO does eventually detect gravitational waves, theparticularities of the waves, including their frequencies, will tellresearchers whether they are part of the stochastic background, or caused bysomething more recent, like a nearby supernova.